When in breeding plumage the tall, elegant Great Egret has few peers. Generally a little over three feet in height, it feeds on crayfish, insects, frogs and fish. A stealthy hunter, this all white bird will wait motionless for interminably long periods of time seeking the right opportunity to strike. This beautiful bird can be found throughout Florida, even in backyards, parking lots and beaches as it seems to have less fear of man than most of its relatives. It is simply hard to believe that these striking birds were almost wiped out in the previous century because great white egret feathers looked fashionable in women's hats! Photo of Great Egret in swamp. Great Egret in breeding plumage. Egrets on nest. Great Egret on the hunt. Male birds fly in and out of the nest during the day gathering nest material. The return and presentation of this material to the female results in a joint celebration. 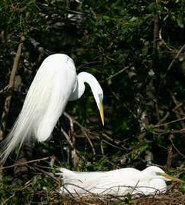 Great egret mating pairs. Note the bright green patches that frame the eyes. Great Egrets in the Venice rookery. Framed by sky and foliage, these beautiful birds are picture-perfect!